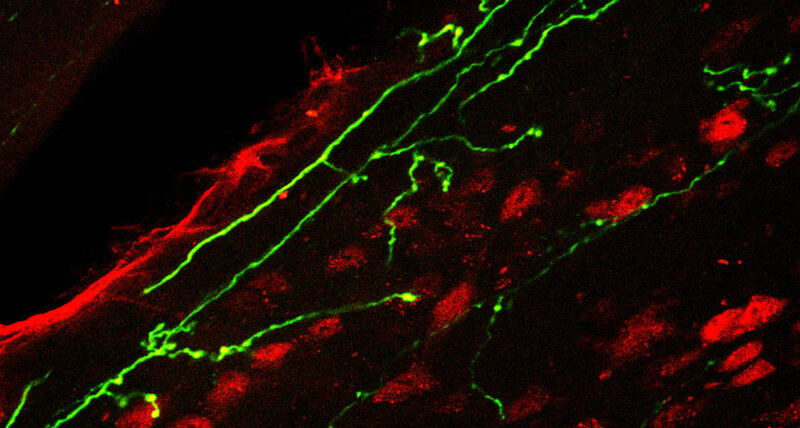 RIGHT ON TARGET A painkiller made with botulinum toxin prevents certain nerve cells (green) from relaying pain information to the brain in mice. Painkillers crafted with a part of the wrinkle-smoothing drug Botox provide long-term pain relief in mice. Researchers added the modified Botox to molecules that target pain-messaging nerve cells. Mice given a single spinal injection of the new drugs showed signs of pain relief for the full duration of the experiments, around three weeks, researchers report online July 18 in Science Translational Medicine. Such painkillers could potentially one day be developed for humans as alternatives to more addictive drugs, such as opioids. Created by the bacterium Clostridium botulinum, botulinum toxin causes the food poisoning disease botulism. Botox, which is made from the toxin, is often injected into people to iron out worry lines and has been used to treat conditions that involve overactive muscles, such as repetitive neck spasms or overactive bladder (SN: 4/5/08, p. 213). The toxin has also been used to reduce the frequency of migraines. Biochemist Bazbek Davletov of the University of Sheffield in England and colleagues focused on botulinum toxin because it can stop certain nerve cells from communicating with one another for up to five months with each injection. And “you locally inject less than a millionth of a gram, which is helpful to avoid any immune response,” he says. Davletov and colleagues created their new drugs with a process he describes as a “molecular Lego system.” Taking the part of the botulinum toxin that blocks nerve cells from sending messages, the team attached the piece to one of two molecules that target neurons that relay pain information. The researchers removed the part of the toxin, found in Botox, that binds to muscle-controlling nerve cells. In the new study, the scientists injected SP-BOT, a botulinum toxin-based pain reliever they’d made previously, into the spinal fluid of male mice with pain due to nerve damage. SP-BOT provided pain relief starting around three days after the injection and lasted through the rest of the experiment. In another experiment, SP-BOT also mollified pain from inflammation due to a different injury. The researchers also created a new formula, called DERM-BOT, which targets nerve cell opioid receptors with dermorphin, a natural opioid secreted from the skin of a South American tree frog. DERM-BOT injected in mice with nerve damage kicked in right away and then provided pain relief to the rodents for over three weeks. The drug was also likewise effective in lessening pain from injuries that produced inflammation.